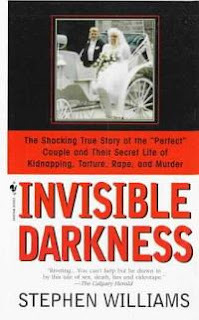 This book Invisible Darkness by Stephen Williams is the true crime account of the case of Paul and Karla Bernardo and the couple's seemingly storybook marriage, which involved kidnapping, imprisonment, and the murder of high-school girls to satisfy their sexual cravings. Rebecca requested this review so this one's for you but I hope everyone finds it useful.To my new readers who might not know this here are some tips on how I am going about this blogging thing.I started reading true crime books back in 2007 but only started blogging about them in February this year.So I review my new books as soon as I have read them but also in the meantime am trying to do reviews on old true crime books that I have read from as far back as 2007.This book is one of them. I am also trying to think up a rating system which is going to be more based on preferences of true crime book readers.Some true crime readers prefer in depth investigations(for me sometimes,depends on true crime writer),some prefer a major portion of the book dedicated to the background and early childhood of the characters(that's me) while some might want more graphic details of the crime itself(not me)so basically my rating system would advise how much of the book is dedicated to each.I do not do reviews on books I did not enjoy(probably because I would then not finish reading it)so all my reviews are on books which I would advise on reading with extra information for the reader. So to get back to my review of Invisible Darkness.This book contains graphic details of the crime and is not for the faint hearted.I distinctly remember being very very jittery while I was reading this book.What absolutely amazed me was the front picture of this couple on their wedding day where they look so much like a normal happy loving couple and then to read this book and find out how crazy people can feed and grow off each other's evil was mind numbing,at best.Despite those details Stephen Williams provides background and early childhood details which kept me clinging on for dear life. Further in the book it comes out that all the crimes were video taped and to get descriptions of what was on the tape and having a well developed imagination I did not even need to actually see those videos to actually know what was in there.Plus the fact that the books contains photographs of the victims made it even easier for me to be an absolutely wreck by the time I finished reading this book. The point is I enjoyed reading the book because Stephen Williams is an excellent writer and obviously his aim was to tell the story and those graphic details are absolutely necessary to tell the story of Paul Bernardo and Karla Homolka because their crimes are totally based on those details.My advice is to proceed with caution.Have a light hearted book ready to read immediately after you have read this book.I suggest Chicken Soup For The Soul because it will re instate your belief in people and the fact that (I believe) people are more good than bad. I don't believe that Karla Homolka got the sentence she deserved because I don't believe in the defence theory of "he made me do it".To help you understand my thoughts on Karla Homolka I want to add that her younger sister was also a victim of this couple.At least Paul Bernardo got what he deserved. This book is not an easy read because of the content but is worth reading for the insight it provides into the way this couples' minds worked and I believe their minds were totally in sync for the crimes they committed. If you would like to find out more about this book then South African readers should access via Kalahari Books and if you want to see more reviews from other readers then the Amazon link which follows will provide that. I read this book in November 2007 and it has 532 pages and it has 8 pages of photographs. It is really scary to think that people like that walk among us! Great review. Have you ever read "The Girl Next Door" by Jack Ketchum? I've been considering it but would like to know what you think. No,I haven't read this book so I quickly went to look it up.It looks very interesting.And I noticed it says Contributor is Stephen King-do you know what that means? Hi and thanks! I hadn't noticed about S. King! Guess I'll be getting it! I couldn't put this down; once I finished it I gobbled up "Deadly Innocence", "Lethal Marriage" and "Karla: A Pact with the Devil"
Have you read any of these? I'd like to know your thoughts. After I read "Invisible" I gobbled up "Karla:Pact w/the Devil" (also by S. Williams), "Lethal Marriage" and "Deadly Innocence". I've read the movie, The Girl Next Door. 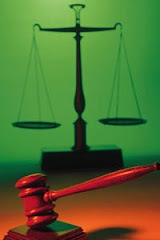 You should read about the case in trutv.com/crimelibrary. Very detailed.